Rupesh Basoya (34) was shot dead allegedly by two unidentified gunmen on Sunday in front of his minor son and nephew while he was watching them play in southeast Delhi’s Taimoor Nagar in New Friends Colony, triggering protests in the area. NEW DELHI:The Station House Officer (SHO) of New Friends Colony police station has been sent to district lines and three personnel suspended after locals alleged police inaction which led to the killing of a man on Sunday, police said Tuesday.Rupesh Basoya (34) was shot dead allegedly by two unidentified gunmen on Sunday in front of his minor son and nephew while he was watching them play in southeast Delhi’s Taimoor Nagar in New Friends Colony, triggering protests in the area.The victim’s family alleged that the police had not done anything to curb the drug menace in the nearby slum area at Taimoor Nagar, despite numerous complaints by the deceased’s brother, Umesh. They claimed that Rupesh was shot dead by drug peddlers who were nursing a grudge against their family. “Based upon the preliminary findings of a vigilance enquiry conducted by additional Deputy Commissioner of Police (South East) to look into the alleged lapses by local police in the context of killing of Rupesh and resultant law and order problem, SHO Inspector Sushil Kumar and Division Officer sub-inspector Rajender have been sent to District Lines,” said Chinmoy Biswal, Deputy Commissioner of Police (Southeast). 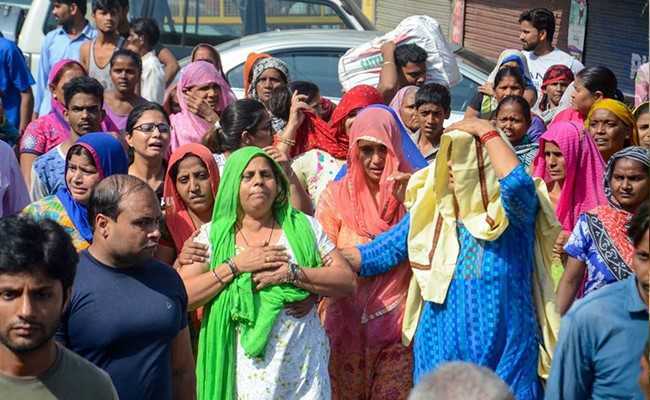 Rupesh’s killing had triggered protests in the area and his family had even placed his body for half an hour on Mathura Road and protested against the local police.